Christine (C.A.) Verstraete is the author of Lizzie Borden, Zombie Hunter. 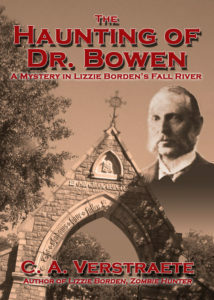 Her new novella, The Haunting of Dr. Bowen, A Mystery in Lizzie Borden’s Fall River, offers another view of the Borden murders by providing a glimpse into how the crime could have affected the Bordens’ neighbor and family physician, Dr. Seabury Bowen. Learn more at her website and blog. Who is Dr. Bowen and why write about him? Dr. Seabury Bowen was not only neighbor to Lizzie Borden and her family – his house was kitty-corner from theirs – but he was also their family physician. Following the murders of Andrew Borden and his wife Abby Durfee Borden on August 4th, 1892, the youngest daughter, Lizzie, sent the maid, Bridget Sullivan, out to find the doctor. He was among the first officials at the murder scene. As there are only newspaper reports and his trial testimony to go from, I started to wonder how the murders might have affected him. Yes, he was a medical professional, but this was a horrible crime – and he personally knew the victims. Beyond the ordinary motives, I thought there could possibly be a supernatural and paranormal influence. Why not? * Bowen was the Bordens’ doctor for 12 years and practiced in Fall River for 26 years, according to his testimony for the defense on the fourth day of Lizzie Borden’s trial on June 8, 1893. * He lived across from the Bordens for 21 years, with the Borden family living there “most” of the time. * Only neighbor Mrs. Churchill and Lizzie were present when Dr. Bowen arrived at the Borden house. Lizzie’s first response to his question of what had happened is “Father has been killed” (or stabbed). * He was the first to examine Mr. Borden, feeling no pulse and observed that nothing else was disturbed. * Lizzie also told him that Mrs. Borden went out as she’d received a note, though Bowen said he wasn’t sure that was her exact words. He also later was described by a Fall River policeman as burning a written piece of paper. Coincidence? * Did you know? He prescribed a small dose of morphine to Lizzie – up to the time of her arrest, the hearing and during her time at the station house. He admitted that double doses would produce hallucinations and loss of memory. Yes, there’s more… but you’ll have to read the book to find out! The short supernatural-flavored mystery (141 pages) is on Kindle, Kindle Unlimited and coming in print. FIND IT HERE. Dr. Seabury Bowen—physician to the infamous Lizzie Borden—swears he’s being stalked by spirits, though his beloved wife thinks it’s merely his imagination. But the retired doctor insists that neither greed nor anger provoked the recent sensational axe murders in Fall River. Rather, he believes the city is poisoned by bad blood and a thirst for revenge dating back to the Indian and Colonial wars. Now, two years after the Borden murders, Dr. Bowen is determined to uncover the mysteries stirring up the city’s ancient, bloodthirsty specters. Can he discover who, or what, is shattering the peace before Fall River runs red? Or will he be the next victim? Part mystery, part love story, The Haunting of Dr. Bowen reveals the eerie side of Fall River as witnessed by the first doctor on the scene of the legendary Borden murders. Dr. Seabury Bowen shoved back the shock of white hair hanging over his forehead and wiped a wrinkled hand across his stubbled chin. His appearance, like his surroundings, could stand a bit of major housekeeping, not that he cared a whit. “Here, it’s here somewhere,” he mumbled. The old man rummaged among the giant pile of documents, books, and what-not littering the large walnut desk in his study. Several minutes later, and after the search through dozens of loose papers, he saw the faded red book lying beneath a tottering pile. He pulled at it, sending the rest of the stack falling like so much unwanted garbage. The good doctor, but a shadow of his once- robust self, flipped the pages. He stared at the offending journal entry before setting the book aside with a heartrending sob. The man reached toward him with long, lean fingers. Dr. Seabury Bowen blinked and tried to make out the features of the unknown figure standing in the corner. The unexpected visitor had a broad, dark face and what looked like a band across his forehead. Bowen stretched out his arm in turn and jumped when their fingers touched, the jolt surging through him like the electricity he knew would soon replace all the gas lights. Bowen breathed hard. He bolted upright and held a hand on his chest, trying to catch his breath. Still stunned, he gazed about the room, disturbed at the odd shapes until he recognized familiar things… the bureau, the armoire, the paintings on his bedroom walls. He swallowed and nodded. He gave her a loving smile before he rose and slipped on his robe, his thoughts in a whirl. To tell the truth, these dreams or hallucinations or whatever they were appeared to be getting stronger and more frequent. Not that he’d tell her, of course. It made Bowen wonder if he was losing touch with his faculties, something he’d never dare mention. Nor did he want to even entertain the thought, but he did. Am I going mad? Am I? * Get the story HERE.